Free Advertising – the $399 iPad has sent shockwaves through the tech world and it might be the gadget deal of the 2010 holiday shopping season. How often do you hear about TJ Maxx or Marshalls otherwise? The result of the huge price cut is that TJ Maxx and Marshalls are getting enormous amounts of free advertising and promotion, and suddenly the two stores are the hot destinations for anyone who wants an iPad this holiday season. iPad for $399 as a Loss Leader – margins on electronics are slim in comparison to clothing and household goods, if TJ Maxx and Marshalls lose roughly $50 on each iPad sold but they can get people into their stores and buying other goods with better margins, they’ll likely more than make up the difference. The big-ticket item loss leader is a pretty standard model for retailers on Black Friday, the iPad just happens to be extra popular and worthy of more press. Companies Aren’t Stupid – you can bet that TJ Maxx and Marshalls did a lot of math before setting the $399 price, they aren’t going to sell something that isn’t ultimately beneficial to their bottom line. Word is that neither store is an authorized Apple reseller, and they probably obtained the iPads through another channel. I’d bet that Apple isn’t thrilled with the drastically reduced pricing, but I’m sure both of these retailers phones are ringing off the hook right now with people trying to track down the cheap iPad. Regardless of the price, the iPad is expected to be one of the most popular electronic gifts this holiday season, and it appeared high on a recent study of childrens Christmas wish-lists for 2010, just below the iPhone 4 and iPod touch. 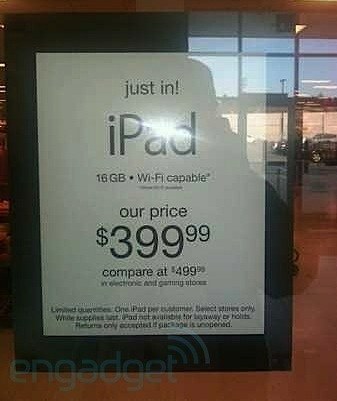 If the iPad is on your shopping list, you might want to call your local TJ Maxx or Marshalls before they sell out. UDID Sellers and Non-Developers Running iOS 5 Beta Being Targeted by Apple? Apple must be FURIOUS at the price, they are undercutting them by 20%, why shop anywhere but these cheap stores? It’s the same hardware under the same warranty. This is absolutely a loss leader to get people into stores, it works. Walmart does the same with thing every year with TV’s, all you need to do is get people into a store when they have that rabid buyer mindset and suddenly every deal is too good to pass up, it becomes a shopping frenzy as people scamper for deals. That’s why it’s called ‘Black’ Friday, it’s when retailers go from Red to Black, and always it’s on the backs of a loss leader. This is consumerism at it’s worst or finest, depending on how you look at it. I’ll probably even join in this year, the price is too good to pass up.